SWEET are a National Treasure, British at the core and a Rock Music Phenomena that has taken every continent by storm for more than four decades. The Golden Thread that links the past through to the present and into the future is Andy Scott. His determination to maintain high standards with the band's musical legacy and touring is legendary. The band today has an illustrious pedigree recreating "live" the high energy and soaring vocals associated with the Sweet sound that is the band's trade mark. SWEET are Pete Lincoln - Lead vocals and Bass Guitar. Bruce Bisland - Drums and Vocals. Tony O’Hora - Guitar, Keyboards and Vocals. Andy Scott - Guitar and Vocals. Sweet is a success story that begins in 1970. When Brian Connolly and Mick Tucker left Wainwrights Gentlemen in 1968 to form their own band "Sweetshop", later shortened to "The Sweet", little did they know what lay ahead. They recruited Steve Priest on bass who was gaining a reputation with his band, The Army. After two guitarists, Frank Torpey and Mick Stewart and four singles which failed to make the charts the band were at a crossroads, almost at the point of splitting when Andy Scott, from The Elastic Band, joined. The year was 1970 and the "Classic" Sweet line up was complete. Brian Connolly, the band's original lead vocalist, had the good fortune to meet record producer, Phil Wainman at the BBC, who had met a couple of songwriters, Nicky Chinn and Mike Chapman, their songs needed a singer and eventually a band. The first Sweet single "Funny Funny" was among the original recordings and the rest as they say is history. The early years brought chart success but did not satisfy the band musically. "CoCo" and "Poppa Joe" gave the band the hits they craved but lacked credibility. The change came with the onset of Glam - "Little Willy" and "Wig Wam Bam" had a tongue in cheek innuendo but when "Blockbuster!" hit the number one spot in the UK, Sweet were arguably the hottest ticket in town. Several more hits followed, "Hellraiser", "Ballroom Blitz", "Teenage Rampage", "The Six Teens" and "Turn It Down" as well as two acclaimed albums "Sweet Fanny Adams" and "Desolation Boulevard". In 1974 The Who invited Sweet to play on the legendary Charlton Athletic gig but sadly it was not to be after Brian Connolly was involved in a nasty attack outside a night club and sustained injuries to his throat. In 1975 the USA had discovered Sweet and the band embarked on their toughest touring schedules to date but with it brought success in the form of albums and singles. "Fox On The Run" hit the top 3 in the USA and is still the biggest selling single worldwide, hotly followed by the musicians' favourite "Action", Sweet were at the very top. The albums "Give Us A Wink" and "Off The Record" and the subsequent singles, "Lies In Your Eyes", "Lost Angels", "Fever Of Love" and "Stairway To The Stars" had less impact but the hectic touring continued and the writing was on the wall - Sweet needed a fresh start. Enter "Love Is Like Oxygen" from the album "Level Headed". This immediately propelled the band back to the top, a worldwide hit single and album, just what was needed. In 1978 "Love Is Like Oxygen" written by Andy Scott and Trevor Griffin won an Ivor Novello nomination and an Ascap Award in the USA, the future was looking good. With good news there is often bad and Brian was soon to leave Sweet. His well documented alcoholism damaged his health during the gruelling tour schedules of the USA and things were never the same after his departure [Brian sadly died on 9th February 1997]. "Cut Above The Rest" and "Waters Edge", though highly rated by reviewers did not reach the same criteria with sales. The band finally ran out of road by 1981/82 with the posthumous release of "Identity Crisis". With Steve now living in the USA and Mick coming to terms with life after the sudden death of his first wife, the Sweet found themselves at a crossroads once again. It was just before Christmas 1984 with Andy now living in Central London when he met Sweet's former agent in the street. They went for a pint and the seed was sown for Sweet to reform and go back on the road. Andy's career as a solo artist/record producer/session musician was just about ticking over and he finally came to the conclusion that the triumphant return of Sweet would be a good idea and has never looked back since. After a couple of late nights with Mick Tucker, Andy contacted Agent Nigel and the grand reformation was set in motion. Steve was duly contacted and it looked for a while that he would rejoin when the plan was solid. Steve eventually pulled away from the reformation citing that he did not want to tour any more, leaving Mick and Andy to find other musicians. The first reformed line-up of Sweet in 1985 was very much a heavy rock ensemble. Vocalist - Paul Mario Day [ex Iron Maiden], Keyboards and Vocals - Phil Lanzon [ex Grand Prix now with Uriah Heep] and on Bass and Vocals - Mal McNulty [ex Weapon now with Slade] joined Andy and Mick to begin the new chapter of Sweet. Tours of Australia and Europe were first on the agenda selling out everywhere. "Live At The Marquee" was recorded during a three night sell out blitz at The Marquee Club in London just before the infamous venue closed it's doors for good and has pride of place as an historic event for the band. All good things must change so when Paul decided to live permanently in Australia and Phil left to join Uriah Heep the band needed new blood. After a couple of dry runs the new band had Mal McNulty move to Lead Vocals, Steve Mann [ex Lionheart and Michael Schenker Group] on Keyboards/Guitars and Jeff Brown [ex Statetrooper] on Bass. Tours of USA, Europe followed as the band continued it's upward surge. In 1990 Mick Tucker fell ill on one of the biggest tours to date, a European venture that was to take in 9 countries in 6 weeks. He'd had an epileptic fit and a recurrence of a previous health problem, pancreatitis. His place was taken by Bodo Schopf [ex MSG] as a temporary drummer but Mick was never to return to the band [Mick Tucker died on 14th February 2002 after a 6 year battle with Leukaemia]. Then there was one - Andy Scott. The very well received album "A" was recorded at Steve Mann's studio in Hannover in 1991 and made an impact on the charts in several territories. Bodo felt his time with Sweet was always temporary so his replacement came in the shape of Bruce Bisland [ex Weapon, Wildfire and Statetrooper]. Andy had worked with Bruce on recording sessions as a producer and musician so knew he could be the right man for the job [he is still with Sweet 20 years on!] The "A" Tour as it became known was another nutcracker taking in the USA and Australia this time but the band weathered it well. 1994 saw another rather unexpected change when Mal decided it was time to move on and everyone was sad to see him leave. The new vocalist was to be Chad Brown [ex Lionheart] and Sweet immediately settled in to record an album of re-records of the hit singles entitled "Glitz Blitz & Hitz". The recordings were faultless and have fooled many people with the accuracy of performance and sound production from Andy. Several Sweet tours including some faraway places, above the Arctic Circle, Greenland and Singapore were negotiated without drama but in true Sweet fashion there was darkness on the horizon, Steve Mann left the band to become head of Audio Post Production at Channel 4 TV. This was too good an opportunity for him and once again with sadness we wished him well in his new career. Steve Grant, a virtuoso musician, stepped up and took over seamlessly as the Keyboards/Guitar man. His touring included The Animals on their reformation tours of the USA and various studio projects. A pattern was developing, as a new guy gets settled another seems to become unsettled and want to leave. Chad had not enjoyed touring for a while and it was during another German extravaganza that he developed a throat infection which left the band with 6 shows at the end of the tour to either cancel or carry on and perform. Naturally "the show must go on" was the decision, as a four piece, with Jeff Brown singing most of the Lead Vocals. It worked well and the band has remained as a four piece ever since. This gave Chad the necessary excuse to leave and the band to head into the studio again to start work on "Sweetlife". The album was finally released in 2002 to favourable reviews with the single "Do It All Over Again" gaining the band a younger set of fans rediscovering Sweet after the band's appearance on TV shows in Germany and the rest of Europe. There was unrest within the band and though they tried to work through it, it was obvious that something had to give and at the end of 2002 Jeff Brown was given an ultimatum and subsequently left the band. Not since the 1980s had Sweet toured the UK so the Glitz Blitz & Hitz tour in 2003 was a big event but the band had no singer. Tony O’Hora had been working with Bruce in Praying Mantis on their once a year tours of Japan. His vocal range is stratospheric and once we realised that he could play bass too then like a phoenix rising we were on our way. Tony brought a new dimension that is still prevalent today. This particular line up of Sweet heralded a bright future for the band and Sweet's appearance on many festivals and the concert footage from the shows bear witness to this. Touring in USA/Canada/Australia/Europe and another theatre tour of the UK in 2005 laid solid foundations for the band. The band was a happy ship but as is the Sweet way something untoward was about to happen. In 2005 Tony had been working at a Music College and enjoying the experience so he initially tried to keep everyone happy, band, home and college - this was always going to be a problem and the band lost. He found it the hardest of decisions but everyone respected him for it and had to move on. Sweet had some eventful shows and tours for six months whilst finding a replacement, a tour of Russia, coast to coast, Vladivostok to Moscow and all points between, with Phil Lanzon back on Keyboards and Steve Grant on Vocals and Bass. Brilliant and surreal! 2006 was a good year. Sweet had a new vocalist. Pete Lincoln is the most complete vocalist the band has had. He has spent many years touring the world with the likes of Sir Cliff Richard, Shaking Stevens and Sailor. The band now performs all of the hits and many album tracks, including "Set Me Free" the song most covered by other artists and Pete has grasped the position of Lead Vocalist and made it his own. The past five years have flown by with appearances on festivals in Europe, another Glitz Blitz & Hitz tour of the UK in 2008, Sweet Fanny Adams Revisited tours in Germany, the annual Sweet fan meeting in the UK at the Robin and several successful visits to Australia. We have just announced Steve Grant's departure from the band after 15 years. We wish him well for the future with his projects, such as Barockestra and thank him for his input, some fantastic playing and sheer craziness during his time with the band. ...... another one opens! Tony O’Hora has rejoined the Sweet on Keyboards/Guitars and Vocals. This is without doubt the finest vocal combination yet and we are all looking forward to the future. October 2011 heralded the release of "Join Together" - Sweet's first single in almost 10 years. SWEET - a band for the future! 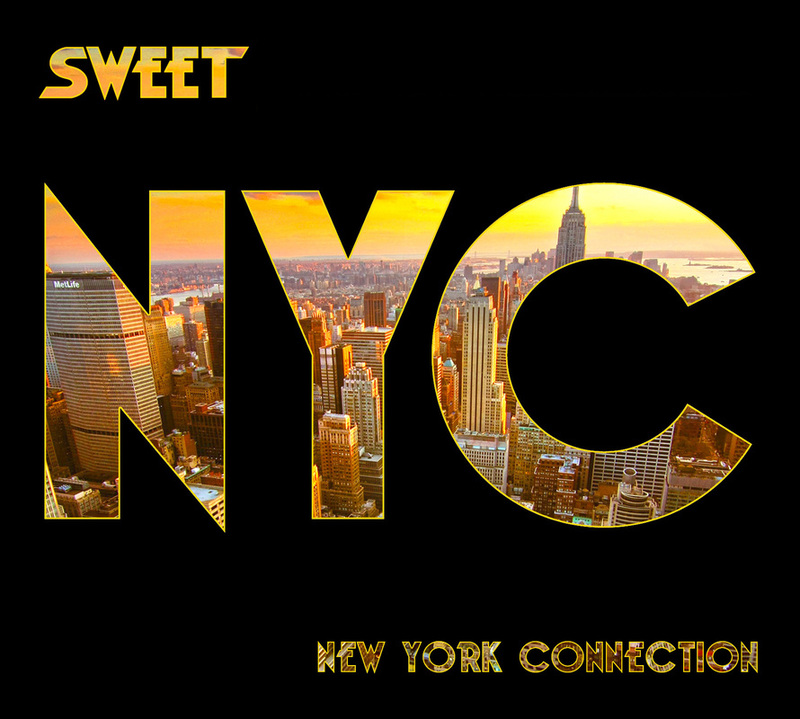 In 2012, Sweet have also released their new album of covers, New York Connection and Andy Scott talked about this and many other things in his Rocktologist Interview.